Dr. DelBello — Children's Orthopaedic Surgeon in Westchester, specializing in Pediatric Orthopaedics, Scoliosis and Spinal Deformity surgery. Children's Orthopaedic Surgeon in Westchester, specializing in Pediatric Orthopaedics, Scoliosis and Spinal Deformity surgery. The practice of Dr. Damon DelBello is unique to the Hudson Valley area because of the scope and quality of orthopedic services offered. Dr. DelBello is a board certified orthopedic surgeon who has advanced fellowship training in pediatric orthopaedics and is an accomplished scoliosis and spinal deformity surgeon. 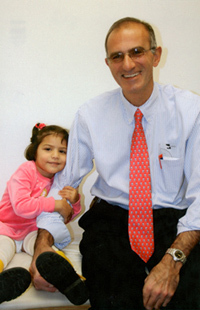 He is the Chief of Pediatric Orthopaedic Surgery at Westchester Medical Center.